THE Federal Government plans to make internet censorship compulsory, putting Australia in the same league as China, Iran and North Korea. The Government will not let users opt out of the proposed national internet filter, which could ban controversial websites on such subject as euthanasia or anorexia, when it is introduced. Broadband, Communications and Digital Economy Minister Stephen Conroy admitted the Federal Government’s $44.2 million internet censorship plan would now include two tiers – one level of mandatory filtering for all Australians and an optional level that will provide a “clean feed“, censoring adult material. This also means that all sites or blogs written by political dissenters will be banned – unless of course your political dissention is in line with party (Labor, Liberal, Family First, et al) policy. Anything deemed racist will be banned. Although this will not effect the millions of anti-White racist sites and blogs. Sites that purport to be “anti-racist” but in reality promote anti-White racism will be the beneficiaries of your future google searches. All free hosting sites such as Google blogs, Yahoo’s Geocities and Lycos’ Angelfire will be blocked from Australians. And of course, this site will be blocked. How will this effect people such as myself? It means that instead of taking on every issue I take offence to and using a blog to make sure I have my say on the matter and leaving it at that until the next topic of interest comes up, I will be forced to pick and choose until I find a topic that is important enough to waste money on thousands of leaflets and the distribution process that goes along with it – and that’s something I’ve had a lot of experience doing. The rest of you “Australians” can crawl into your kennels and bark at the JOG for all I care. I have made my plans and I know precisely what I’m capable of accomplishing. XV. 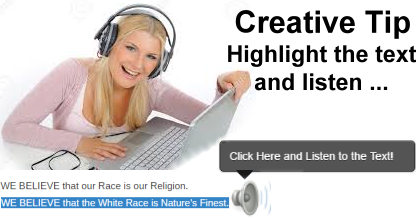 As a proud member of the White Race, think and act positively, be courageous, confident and aggressive. Utilize constructively your creativity ability.